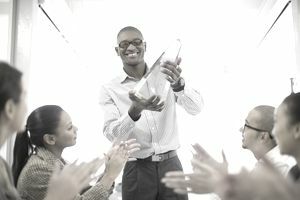 Giving awards to employees is great motivation and improves employee morale. But there are limits to how much you can deduct for these awards, including employee achievement, safety, and service awards. You also need to know the tax implications for employees of these awards. If they are taxable, you must deduct payroll taxes from the award. Businesses can deduct up to $400 for all awards of tangible personal property given to any one employee annually. For example, you can deduct the cost of a watch for 30 years' service or a plaque for a safety award. This limit does not apply to awards made as part of a qualified retirement plan. Gift certificates don’t count as awards for this deduction because they are not “personal property.” Personal property is property that is owned by an individual or a business that is movable and is not land or buildings. So a plaque or a watch would be personal property. You can provide a catalog of products and allow the recipient to choose one since the products are tangible personal property. These catalogs have different cost levels for different lengths of service; more costly gifts for longer service. The IRS has special rules for employee achievement awards made by partnerships. In this case, the deduction limits "shall apply to the partnership as well as to each member thereof." The purpose here is probably to avoid having the partnership get around the rules by having individual partners offer the awards. If you want the awards you give employees to be non-taxable to them, make sure that you have followed all IRS regulations. They don't exceed $400 per employee for non-qualified plan awards, and they don't exceed a total of $1,600 a year for all awards of any kind. Length of service awards can't be received during the recipient's first 5 years of employment, or more often than every 5 years. A qualified plan for awards must be an established or written plan that does not favor highly compensated employees. In addition, the average cost of all employee achievement awards given during the year can't exceed $400. Safety awards, to qualify as non-taxable, (a) cannot be given to more than 10 percent of the employees, and (b) can't be given to managers, administrators, clerical employees, or other professional employees. The amount wasn't based on the employee's salary. The IRS defines employee achievement award to include specific terms for length-of-service awards, safety awards, and awards given during "meaningful presentations." The award should "not create a significant likelihood of the payment of disguised compensation." The cost of tangible personal property awards under the limits set by the IRS is not taxable to the employee. All other awards are considered compensation, including awards of travel and gift certificates, and are subject to payroll taxes. You must withhold federal and state income taxes from these awards, and these awards are subject to FICA taxes (Social Security and Medicare) for both employee and employer. To determine the taxable amount of an award to an employee, you must consider fair market value, not cost. For example, if you purchased some TV monitors at a deep discount and gave them to employees, you must find the retail price and use that to determine the taxable amount to employees.